At the end of October is Halloween, the Feast of All Hallows, when mediaeval man believed ghosts thronged the lanes and trackways of merry England. “The Dead do speak to the Living,” this mediaeval saying expresses what men such as Chaucer, the Black Prince or Richard II considered to be that very thin line between this life and the world to come. In the medieval era, devotion to the dead was powerful. All the great churches, and indeed many small ones, had chantry chapels so priests could pray for the dead. Mediaeval man believed, I would say correctly, that once the soul left the body it began a long journey. Prayers, Masses, candlelight, alms giving and other good works assisted the soul in its journey which theologians described as the great pilgrimage to God. Of course this journey, like any pilgrimage on earth, had its dangers; demons and the souls of the wicked prowled like starving wolves eager to seize a victim. Defence against the Power of Hell was something to consider even with the practical arrangements of burial. The Lords of the Soil like to be buried within the church, close to the high altar where Mass celebrated every day would afford the protection whilst internment, garbed in the robes of a Franciscan or Dominican, proved to be spiritual armour against demonic onslaught. Patron Saints would also be cultivated so that the Great and Good of the heavenly court could afford you protection. Cemeteries were not just “bone yards,” a graveyard was God’s Acre, hallowed and sacred ground where both your body and soul could rest in peace. God help you if you died excommunicated from the church or committed suicide. If the latter, burial would have to take place at a cross roads with a stake driven through your heart. Cross roads were haunted places and places to avoid. Excommunication carried equally dire sanctions. Geoffrey de Mandeville, Earl of Essex and the devastator of abbeys and monasteries in the eastern shires, died un-reconciled to the church. The bishops of England decreed that he could not be buried in consecrated ground. Nobody would help the de Mandeville family except for the newly established Order of the Templars. They accepted de Mandeville’s coffined corpse into their churchyard near the Strand in London. They obeyed Holy Mother Church and did not give de Mandeville burial in holy ground; instead they hung his coffin in chains from the branches of an ancient yew tree in God’s Acre. Naturally, with such a vivid interest in the afterlife, the mediaeval mind truly believed in ghosts, those souls who did not want to begin their journey but stayed to interfere in the affairs of men. This was particularly true of the ghosts of those who had either done great evil or had been the victim of murder. Evidence of this is seen in many of Shakespeare’s plays such as ‘Julius Caesar,’ ‘Macbeth’ and ‘Hamlet’ where the appearance of a ghost lies at the heart of the action. At the end of October is Halloween, the Feast of All Hallows, when mediaeval man believed ghosts thronged the lanes and trackways of merry England. After the sun had set and dusk was settling and the vespers bell had rung, the hour of the bat arrived when the spirits walked. 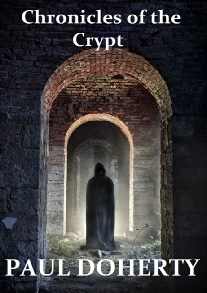 To commemorate this I shall, this October, be publishing in e-book format, a number of original mediaeval ghost stories. I do hope you enjoy them. Let me hasten to add that I am still continuing with my novels. THE LAST OF DAYS was a great success (thanks to you). I have now submitted ROSEBLOOD to Headline, a novel set in London describing the gang politics of the city in 1455 as England drifted rapidly towards civil war and all the bloody strife of the Wars of the Roses, that hideous fight to the death between the Houses of York and Lancaster. I have also submitted a new Athelstan to Severn House, CANDLEFLAME, I do hope you enjoy it. Another in the series, THE BOOK OF FIRES is in preparation. Once I have finished that, I may turn to more short stories on the theme of reincarnation. Believe me there are times when I am certain that I once lived in the Middle Ages……. In the meantime, I do hope you all had a pleasant summer. May your reading continue to be mysterious, murderous and mediaeval!